Salem gathers for Aiden and Hope's wedding. Check out the day-to-day spoilers and a sneak peek video below to find out what's happening on NBC soap opera Days of our Lives during the week of November 2-6, 2015. All of Salem gathers at the Martin House to celebrate the town's Bicentennial Gala - a night that promises to be full of romance, mystery and danger; Abigail (Kate Mansi) stumbles upon incriminating evidence against Ben (Robert Scott Wilson); Caroline (Peggy McCay) tries to get Victor to see the truth about Bo (Peter Reckell); Stefano (Joseph Mascolo) and Andre (Thaao Penghlis) wish Hope (Kristian Alfonso) an ominous "good luck" with her wedding. 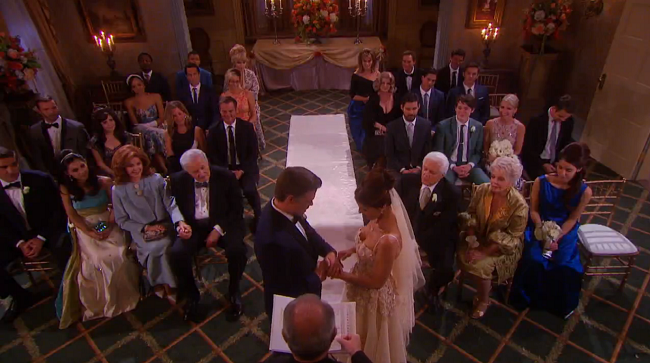 Citizens of Salem make a toast to their beloved town – and Tom and Alice Horton; Hope (Kristian Alfonso) and Aiden's (Daniel Cosgrove) wedding begins; Bo manages to contact Caroline; Abigail ends up in a dire situation with Ben. Abigail finds herself in a dire situation with Ben. Bo tries to stop Hope from marrying Aiden; Caroline goes to great lengths to delay the wedding; Abigail struggles to escape from Ben, who continues to unravel; Adrienne (Judi Evans) is shaken when she sees Eve (Kassie DePaiva) and Justin (Wally Kurth) share a kiss. Aiden makes a difficult decision on his wedding night; Abe (James Reynolds) confronts Lani (Sal Stowers); Steve (Stephen Nichols) and Bo (Peter Reckell) arrive in Salem, but has Hope's fate already been sealed? Sami (Alison Sweeney) returns to town armed with startling news; Hope fights for her life; Theresa (Jen Lilley) and Brady's (Eric Martsolf) relationship takes an unexpected turn; Steve receives a disturbing note. - James Read Leaves 'Days of our Lives' as Clyde, Says He Had A "Fabulous Time In Salem"
Sounds like the best week of DAYS in recent memory. I'm excited for this week of DAYS! This is going to be the best week in a long, long time. Ben and Abby to Hope and Bo. My favorite being Bo and Hope. What a great way to do the 50th. Looking forward to watching these story lines unfold.